Starring: Jesse Eisenberg, Mark Ruffalo, Woody Harrelson, Dave Franco, Lizzy Caplan, Daniel Radcliffe, and more. Three years have passed since the first ‘Now You See Me’ came out to the big screen. Now, in 2016, audiences have the chance to see the second installment in the magic-oriented action comedy. 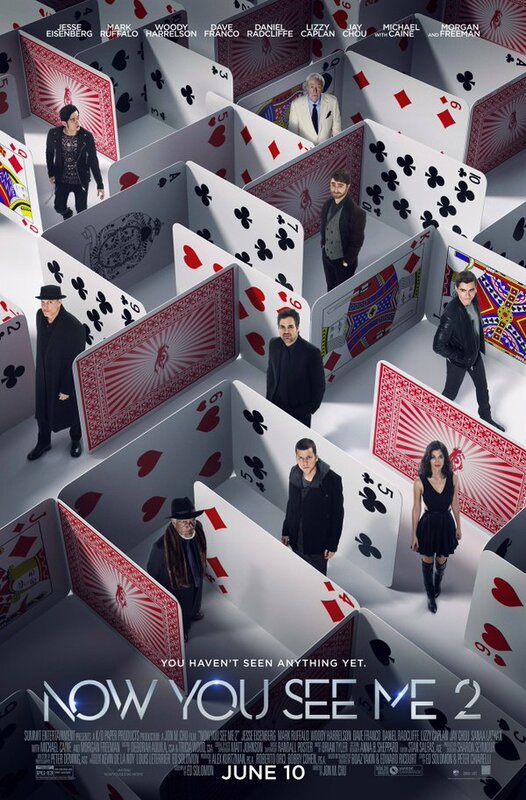 ‘Now You See Me 2’ brings back familiar faces fans know and love as well as a number of new and mysterious faces. Will the magic still be there for part two of this act? Or will it be curtain call for the Four Horseman? You make the decision…. After reading my opinion, of course. It has been two years since the Four Horseman made their jump off of the rooftop and showered their loving fans with money during their grand finale of a magic show. Since then, they have been in hiding at the order of The Eye. Yet have been itching to return to the stage and put on shows that mean something to their fans and help them. No one is more antsy to break out of the shadows than Atlas himself (Jesse Eisenberg). After going against the Four Horsemen’s leader’s word, Dylan (Mark Ruffalo). Atlas seeks out The Eye and asks when and how can the magical group get back onto the stage. After communicating with The Eye, Atlas runs into a so called “fan” at his house by the name of Lula (Lizzy Caplan). During their meeting, Atlas believes Lula is just a crazed fan until she vanishes from thin air and he becomes skeptical of her. Atlas then reunites with familiar friends Merritt and Jack (Woody Harrelson and Dave Franco) and explains the situation as they go to meet up with Dylan. Only to witness the fan is none other than the next Horseman due to unforeseen events that resulted in Henley’s departure. With the Four Horseman four again, Dylan makes the decision that it is time to return to the big stage. The Four Horseman are given a target, Owen Case (Ben Lamb). A magician/technical genius who has been wowing audiences since the horseman’s disappearance, yet is nothing short of a thief in regards to his ability to steal people’s information. As the Four Horseman make an attempt to end Owen’s fraudulent act, a bigger magic trick is being prepared. Old enemies resurface and interrupt the Horseman’s attempts and ultimately causes them to run from the FBI. After a series of unexpected events, the bigger picture is revealed and the Four Horseman are now forcibly hired by a mastermind whom of which needs them to pull off a heist to acquire technology once stolen from him. Typing out the summary really makes this film seem way more difficult than it actually is. I swear it is entertaining. Well, it was to me, but whatever. ‘Now You See Me 2’ continued with the same amount of excitement that I was left off with from the first one. The tricks were wildly entertaining and hilarious at the same time. The entire team of actors and actresses in the movie brought a certain kind of presence to the screen with each scene. The film continued with their trend of unexpected twists that few may expect and I continued to love just as much as the first film. As I sat there at the end of the film. I was attempting to figure out which one I liked more and to be honest, I can not really pick one. I do have a minor issue where in the middle of the film, I had a brief moment of being bored which I did not experience in the first film but as soon as the magic tricks and acts begun again, I was instantly back into the groove of being entertained. ‘Now You See Me 2’ is a frequent wave entertainment. Perfectly meshed together with film and stage magic. If you have the chance, check this one out and if you have not seen the first, you definitely should see that before this.